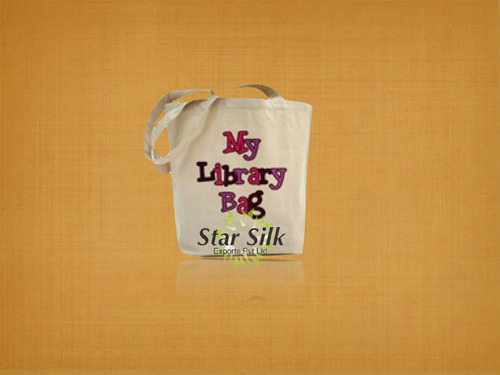 Cotton Library Bag-- Bags made of 100% regular cotton fabric. - Samples sent using client courier account, or using our FedEx account, for a fee of USD 30, payable via Paypal. With experience of more than seven decades, we are engaged in exporting Textile Items such as Mesh Bags/Cotton Net Bag, Baby Garments ,Textiles, T-Shirts, Bed Sheets and Yarns. Procured from reliable and authentic sources of the industry, we are engaged in offering our clients with a variety of Bags, Aprons, Linens, Kids wear, Cushion Covers, Bedding, Blankets and Yarn. Moreover, we also offer Baby Garments, Textiles, Terry Towel, Bed Sheets and T-Shirts. Owing to the unwavering efforts made by our highly dedicated staff, we have been able to procure our product line from reliable sources of the domain. We always make sure that the range that we are offering is in strict accordance with the industry standards. Moreover, our vendors have always prioritized our demands and have helped us in meeting the bulk requirements of our clients within the committed time frame. Our export market comprises North America, South America, Eastern Europe, Oceania, Mid East and Western Europe.